Traveling to Winnemucca Lake, accessible from Carson Pass, is a favorite activity year-round for locals and visitors to South Tahoe. In the summer, people hike the trail to Winnemucca Lake in order to find Sierra Nevada Wildflowers, to go swimming, and to fish. During the winter, people backcountry ski, cross-country ski, and snowshoe to Winnemucca Lake (and beyond) for the adventure, views, and ease of access. Since Carson Pass and the surrounding area sits above 8,000 feet, you can nearly always find snow between December and April at this location. I will often cross-country ski my first and last trips of the winter to and from Winnemucca Lake thanks to the fact that the area receives and holds snow early and late in the season. 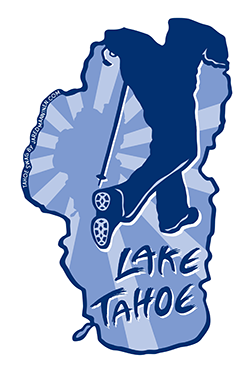 And during low-snow winters at Lake Tahoe, this route is sometimes the only place you’ll find reliable snow in which to cross-country ski and snowshoe. Click on the above map to enlarge it for better viewing and printing. This map is only for reference and shows the more direct route to Winnemucca Lake. This route is approximately four miles round-trip. Always carry a traditional topographic map and compass when traveling in the backcountry. Click on the above map to enlarge it for better viewing and printing. This map is only for reference and shows the longer route to Winnemucca Lake, with an alternate vantage point overlooking the east and southeast. The primary route highlighted here is a little over five miles round-trip. Always carry a traditional topographic map and compass when traveling in the backcountry. Park at the Carson Pass Sno-Park on the south side of State Route 88, west of Hope Valley. Prior to your arrival, you’ll need to purchase a Sno-Park permit ($5/day, $25/season) either online or in town. Without a permit you run the risk of being cited for a $100 ticket. The small investment is worth it, and it ultimately funds the snowplow operations necessary to keep the parking area open during the winter. If the south lot is full, there is another parking area on the north side of SR 88 that is still technically part of the same Carson Pass Sno-Park. Just be cautious when crossing SR 88 (if you park in this north lot) as its snake-like design makes it challenging for motorists to see you when inclement weather is present. There’s also limited space in which to walk along the road from the north lot to the south lot. There are pit toilets located at both lots. They’re emptied and cleaned routinely, but I’ve seen them at their best and worst. Plan accordingly. The trailhead for cross-country skiing and snowshoeing to Winnemucca Lake begins at the Carson Pass Sno-Park on the south side of SR 88. Here’s a map to help you find Carson Pass. 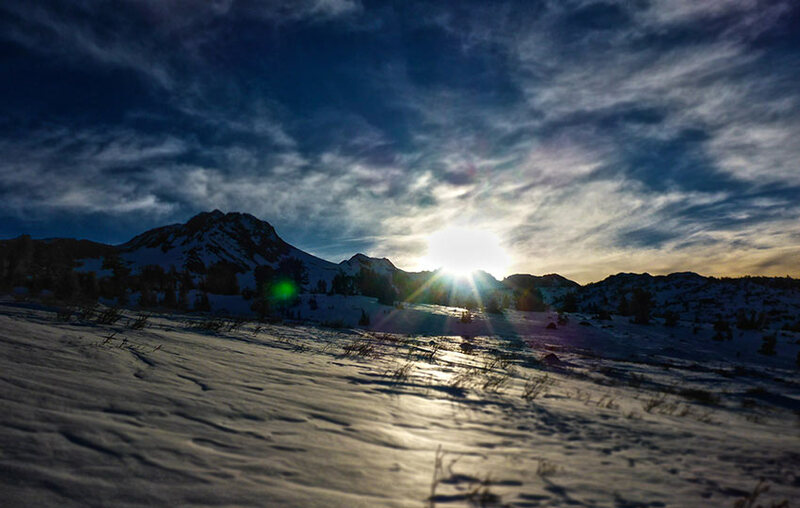 The trailhead to Winnemucca Lake via cross-country skis or snowshoes begins at the south lot of the Carson Pass Sno-Park. On a typical day during the winter, the trail leading south out of the parking lot will be tracked out and obvious (just to the side of the seasonal visitor center — not open during the winter). Although this route is frequently used, I wouldn’t say that it’s ever crowded. This just happens to be the main pipeline to a lot of open terrain so it sees a lot of use over the course of the winter. This is a good thing, though, as it’s a very easy trail to follow. However, you’ll find some of the arguably more challenging terrain within the first half mile of this trail if you’re cross-country skiing en route to Winnemucca Lake. The reason why the terrain through this initial section is challenging is due to the fact that the trail is relatively narrow and it travels and traverses uphill (then downhill on the return trip). When the snow is fresh or warm and slushy, you basically have to contend with an uphill climb. Not a big deal. But when the snow is old and has been glazed over from frequent use, as well as repeated freeze/thaw cycles, it can be icy and terrifying. Make sure you’re proficient with the herringbone and side-stepping techniques and you’ll be fine going up, and then be sure you know how to regulate your speed coming downhill via a modified snowplow. Or, just take your cross-country skis off and hike up or down the trail during these parts. If you’re snowshoeing, this section will be no problem for you. Other than those brief uphill sections, the route to Winnemucca Lake is pretty typical for an off-track cross-country ski day trip. There are varying degrees of angles of terrain in which to negotiate, but it’s all low-angle stuff. I’ve presented two options (see the maps above) for your adventure. One is clearly more direct than the other. For all intents and purposes, you’re just going to travel due south to reach Winnemucca Lake and return along the same path. There’s nothing wrong with this, but it’s only about four total miles and you’ll miss some views. Instead I prefer to cross-country ski up to Frog Lake and then contour the base of Elephants Back on my way to Winnemucca Lake. This option ends up being just over five miles in total distance. The longer trek yields more long-distance views since you’ll be traveling at a slightly higher elevation for most of the trip to the lake. Another variation to this longer route is to continue traversing around the base of Elephants Back to its south side. Then travel to the eastern edge of the saddle between Elephants Back and Winnemucca Lake for some incredible panoramic views looking off to the east and southeast. Another hazard that should be obvious when traveling anywhere across snow at the beginning or ending of the season or during a low-snow year is that rocks and roots are close to the snow’s surface or could actually be poking out. Again, I like to cross-country ski to Winnemucca Lake during these times of the winter because it is some of the most conveniently accessible terrain to receive snow. However, it can be an obstacle course at times, so always be prepared for the unexpected (i.e. proceed on downhill sections with extreme caution in these situations). Wrecking your skis is one thing, but wrecking yourself is a completely different (and more dangerous) scenario. One last word of caution is to be really careful on the final descents down to the parking lot. Accidents frequently occur at the end of a trip due to fatigue and exhaustion, so you can’t afford to let your guard down despite being so close to the end. I can’t emphasize enough that if you need to remove your skis to safely negotiate the steeper sections, do it. You’re not going to win any prizes for attempting to ski beyond your fitness or skill levels. Other than having a great time, your primary goal for any winter adventure is to safely return home. For information about hiking to Winnemucca Lake during the warmer months, read Winnemucca Lake.